A screen shot of "ECHO :: Canyon," a video game which functions as a "musical instrument." Photo courtesy Robert Hamilton and Chris Platz. Approaching the jagged coastline of the computer-rendered island, with the choppy, digital sea below and the alien rock formations off in the distance, a soft hum becomes audible. As the mainland comes into focus, the hum grows louder. Notes of varying timbre become more distinct and harmonies emerge. It sounds a bit like a symphony warming up, or the early strains of some Brian Eno-esque drone recording. High above, a cluster of massive boulders are suspended in midair -- reminiscent of the science-fiction dream world of James Cameron's "Avatar." The otherworldly landscape, and the sounds accompanying it, is a part of a video game called "ECHO :: Canyon." Pulling back, we see that our aerial tour is coming to us from the vantage of a four-winged creature, which swoops and ascends as it works its way around the strange terrain, as one of the game's co-creators, Robert Hamilton, directs it with a controller. Watching closely we notice that a constant wavering sound corresponds directly to the fluttering of the creature's wings. As it dives near the water and whooshes through a canyon, the sounds shift and change accordingly. 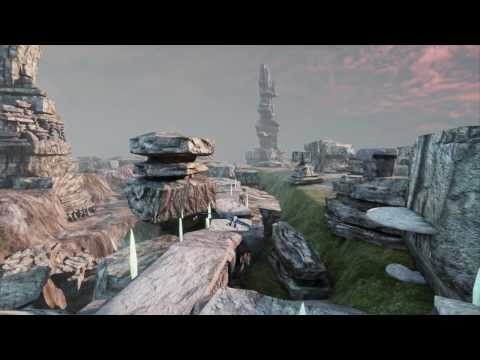 And here is where ECHO :: Canyon becomes more than a game. While traditional video games feature a prerecorded soundtrack, only occasionally punctuated by other sounds and riffs to indicate impending danger or the completion of a challenge, the sounds and music of ECHO are essentially created by the player's choices and movements. It's a game that can be played in the traditional sense, but which can also be "played" in the same way a musician would play a synthesizer. "Think of it as a musical instrument," says Chris Platz, who co-created the game with Hamilton. "It's like a different type of band, a different sort of performance. It's a brand-new form of expression." The search for new and novel avenues of artistic expression is what brought Hamilton and Platz together, and it is exactly what they hope to inspire in those who attend their workshop, titled "Designing Musical Games :: Gaming Musical Design," where the pair will help attendees learn how to create musical games of their own, at Stanford's Center for Computer Research in Music and Acoustics later this month. Their seminar is one of many featured this year at the annual CCRMA Summer Workshops. Hosted by the CCRMA -- or "karma" -- the workshop series has been held since 1967, just a few years after CCRMA founder John Chowning first began experimenting with computer music on the Stanford campus 50 years ago in 1964. The workshops began even before CCRMA was established under its official name, in 1974. "It's venerable," Chris Chafe, CCRMA's director, says of the workshop series, which is open to the public and attracts a wide variety of interested parties from around the world. Over the years the workshop has served as a hotbed of innovation and experimentation in computer music and the science of sound. The CCRMA Summer Workshops 2014 kicked off on June 23 with a week-long course titled "Music Information Retrieval," a class about how to write programs that will allow a computer to "listen" to music, so that the machine might then do any number of things, such as organize a library of MP3s by genre without any help from the discerning ear of a human. On July 14, Elaine Buckholtz and Sasha Leitman will begin a course titled "Aspects of Sound in Art," which will explore the various ways artists incorporate sound into art installations, and how sound can influence mood and perception. Leitman will join with Michael Gurevich, an assistant professor of performing-arts technology at the University of Michigan's School of Music, for a course called "New Music Controllers," that will go over a variety of programming languages and protocols for use in creating electronic musical instruments. It's an area of study that is growing rapidly as the music-production capabilities of computers becomes more advanced, and musicians look for new ways to create and manipulate sound on their machines. In 1964, when Chowning first began toying with programming computers to play music, he used punch cards and a mainframe computer, which had to take time to process the commands he had coded before spitting out a tune. As the technology developed and so called "real-time" synthesis became a reality, piano-style keyboards were attached to musical synthesizers, and drum machines were created that allowed users to create looping patterns that mimicked the percussive sound produced by traditional drum kits. We've come a long way since those early days. Today, smartphones have the computing power to store an entire orchestra worth of synthetic tones on top of plenty of other sounds that no analog instrument could ever produce. And yet, the piano keyboard and relatively rudimentary pattern sequencers remain the primary methods for playing synthesizers. "It's not ideal," Leitman says. "We have all these new sounds available to us in the computer, but we still haven't really found an intuitive way to interact with those new sounds," Leitman says, explaining that the 88 black and white keys of a traditional piano keyboard "doesn't approach the kind of flexibility we need. ... There's tons of room to invent." One of the courses this summer seems specifically geared for pure, uninhibited innovation. During the week beginning Aug. 11, John Grazgow, a doctoral candidate at CCRMA, will lead a workshop titled "3D Printing for Acoustics," which will use the new technology of 3D printing to create physical instruments. Marlo Kohn, an associate director of Stanford's Product Realization Lab, who will be assisting in the workshop, says the class will "allow people to experiment with new forms and create instruments from scratch without the skills of a trained craftsperson." Though one might argue that only a master luthier ought to try their hand at crafting a guitar or lute, Kohn notes that there is a distinct advantage that the uninitiated possess -- namely that they haven't been told what they aren't allowed to do and therefore are free to be "open minded, tinker and experiment." Ultimately, experimentation, innovation and creativity is what the Summer Workshops -- and CCRMA for that matter -- are all about, according to Chafe. "It attracts artists who are experimentally inclined," Chafe says, noting that both artists with a knack for computers and technology, as well as technologists with a passion for music converge at CCRMA -- never sure of what will happen, but knowing that they will exchange ideas and create. "CCRMA is a place where surprises can happen." Register: Registration for all future CCRMA Summer Workshops is open to the public. To sign up go to ccrma.stanford.edu/workshops or call 650-723-4971.